Anson Wright of Chaco Alliance talks about the status of the efforts to prevent the paving of the north road into Chaco Canyon. Our goal is to improve the road (which increases safety), rather than pave it. Please note that the old "dont-pave-chaco.com" web site is no longer valid. Please bookmark "Chaco Alliance" and check back periodically for updates. Much is happening (more on that in future posts). Thanks for all your support - keep it coming! The debate goes on regarding the proposed paving of the north road into Chaco Canyon. Leslie Linthicum of the Abuquerque Journal continues to write good, informed articles about the road status, with two new articles posted during February. You can find them at the Protect Chaco Canyon Blog. Leslie's February 15 article, titled, Pave or No? Chaco Road Fight Costly, is the first of two articles discussing the latest in the fight. She ends it wondering at the nearly $1 million price tag of the proposed paving, and why it is so important to some to pave this road in to Chaco. CHACO CANYON — Stand here on a winter's day, and it's easy to ignore the emotional and seemingly unending debate over whether to pave the road that leads into the national park that holds the treasures of Chacoan culture. It's quiet here. The high desert has put on its tan coat for the winter, and the pre-Puebloan ruins are able to find cover in the landscape. And besides you, there are only a couple of dozen other people in the entire park. The journey here has taken you off velvety smooth U.S. 550 and onto CR7950, where the pavement ends and turns to dirt 13 miles from the park's entrance. Whatever your reason for being here, you have now become part of the argument concerning improving this road with something called a chip seal, a technique that produces a smooth surface that looks and drives like pavement. County officials and the state's Indian Affairs Committee are on the paving side of the argument. Environmental groups and Friends of Chaco and the Chaco Alliance are against paving but in favor of making the road safer with grading, gravel and maintenance. If you haven't already noticed, the road that leads you here is a critical part of the Chaco experience. It forces you to slow you down and prepare yourself to visit one of the places in the world where ancient history reaches out and grabs you. How true! The last 45 to 60 minutes on the road into Chaco allow me to truly Be Present in Chaco when I arrive — essential for the experience I seek, in the usually limited time I have. There are all sorts of possible compromises that are better [than paving]. Abandoning the chip seal paving idea for gravel and bar ditches would be the obvious one, combined with actually maintaining the road — something regular travelers on the road have found lacking. When you stand here on a winter's day with the sun glinting off Fajada Butte, it's not hard to imagine the ancestors of today's Pueblo people farming, grinding, hunting, praying — building a bustling city from nothing. And it's not hard to imagine all that drying up and them moving away — leaving nothing but road ruts and the bones of buildings. If there is a place in the national park system where it makes sense to limit visitors and continue to offer an experience that is natural and quiet and free from crowds, it is right here. San Juan County can do that with a road grader and an end to its obsession with paving this road. UpFront is a daily front-page opinion column. You can reach Leslie at 823-3914 or llinthicum@abqjournal.com. Read all of her columns at ABQJournal.com/upfront. Leslie indicates that a county report even says that paving would increase driving speed and decrease safety along the road. And she talks about the tourism services in the surrounding area, like motels and restaurants, that would benefit from the increase in visitors. Seem to be some powerful interests at work here. But the degradation of the Chaco visitor experience is not worth the exchange; not for those of us who love Chaco, and want to see it preserved for future generations. Let's hope the efforts to preserve Chaco and the missteps by the county keep the road from being paved — ever. If you are looking for news about the "Don't Pave Chaco Road" efforts, it can now be found at the Chaco Alliance website. Please note that the site address has been changed, so update your bookmark. Chaco Alliance is the main site to go to for information related to the efforts to prevent the paving of the north road into Chaco Canyon. 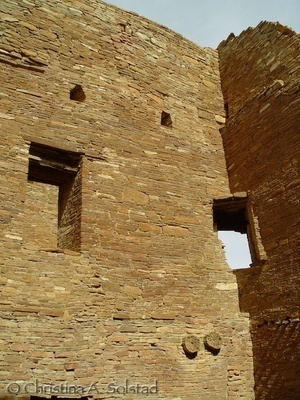 The Protect Chaco Canyon Blog is the other informative site (be sure to bookmark this too), updated as needed with articles and news relating to the Chaco Road. Be sure to look around here, as it is a wealth of info, and you can see the progression of events and articles related to the road. I will be posting soon with info on the latest two articles by Leslie Linthicum of the Abuquerque Journal. 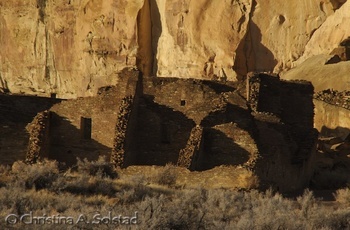 If you can't wait, go to the Protect Chaco Canyon Blog to read them. The efforts to stop the paving of the road have been quite an adventure, going at a snail's pace - onward ho! Anson Wright, Chaco Alliance Coordinator, has written an article for the Rio Grande Sierran (download pdf file), published by the local Sierra Club chapter. Unfortunately, there is not much progress to report from the February 12 meeting in Aztec, New Mexico. There is continued criticism of the Environmental Assessment being conducted on the north road into Chaco Culture National Historical Park (CR7950), detailed in the article. There is action you can take to help the efforts to stop the paving of the road. Thank you for any actions you take to help prevent the paving of the road. It does make a difference. Visit the Chaco Alliance website or the San Juan Citizens Alliance website for more information. A Chaco Canyon visitor recently sent me this email. I am delighted that he shares my concern about protecting Chaco. Although I live in Tennessee our family is a somewhat frequent visitor to Chaco (3 times in the last 3 years). We really enjoy camping and hiking there and the fact that it's not like the Disneyland atmosphere of Mesa Verde. I am very concerned about increased access and have written a couple of emails supporting the non-paving of the road. I have limited information on the regular goings on in San Juan County politics and happened to stumble across your blog when looking for something else. If you would like to keep my email address handy for whenever emails need to be sent to the local authorities, I would be happy to do so. Thanks for your efforts in all this. Thanks to all of you who also love Chaco and are willing to take action to help protect this amazing World Heritage Site. I will continue to keep you updated on any new developments. The Chaco Alliance website is a good place to check back regularly. Here are more reasons not to pave the road into Chaco Canyon, in this short film by John Sefick. "One of the special graces of Chaco is that it offers visitors a certain level of freedom and certain relationship with this incredible environment, both the natural and cultural features we find here." I completely agree. 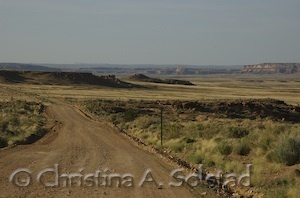 The unpaved road is one of Chaco Canyon's many charms, and adds to the adventure. Many thanks to all of you who have written emails to regulators in efforts to stop the paving of the north road into Chaco Canyon. If it were not for our emails, the entire road might be paved by now. We need to continue to write emails to those listed below. Please visit the Chaco Alliance website for updates. Five main points must be stressed in your emails. Please add your own thoughts and experience. The paving of the road will be a disaster to this World Heritage Site. Increased visitation will overwhelm the staff and infrastructure, threaten sacred/archaeological sites, and change the nature of the visitor experience forever. An Environmental Impact Statement (EIS) must be completed, not simply the Environmental Assessment (EA). A meeting (Stakeholder Workshop) is being held near Chaco Canyon this coming Tuesday, February 12, to provide input into possible alternatives to the paving of the road, such as leaving as-is, chip-sealing, engineering changes, and increased maintenance and signage. URS Corporation and Taschek Environmental Consulting have been retained by San Juan County and the Federal Highway Administration (FHWA) to lead a study under the National Environmental Policy Act (NEPA). The consultants apparently plan to incorporate the input from the meeting into an environmental document. Anson Wright, coordinator for the Chaco Alliance, is attending. I will provide updates as I get them, and you can also check the Chaco Alliance website or the San Juan Citizens Alliance (SJCA) website. Don't Pave the Chaco Road: Why Should You Care? What would happen if the north road into Chaco Canyon was paved? GB Cornucopia, a park ranger at Chaco for 20+ years, who considers Chaco his home, put it something like this when a visitor asked this question recently: First of all, I cannot give an official opinion as a park employee. But my personal opinion? I would leave, because the Chaco that I know and love would change. The road keeps the looky-loos out, ensuring those who do visit are of like mind and appreciate and respect Chaco's wonder and beauty. Paved road = increased visitation. This is upheld by studies. More visitors mean less access, due to limited park resources, and overwhelmed infrastructure. More Chaco resources: Both Friends of Chaco and Chaco Alliance are organizations dedicated to preserving and supporting Chaco Canyon. Friends of Chaco. A 501(c)(3) corporation to help and support Chaco. Anyone can become a member. Federal budgets are slim these days, and membership helps to support programs and volunteers that are essential to the park's wellbeing. Check out the photos of Chaco in the snow and the flowing wash and flowers from the rains! Chaco Alliance. "The Chaco Alliance is a grass roots citizens' group dedicated to preserving and protecting Chaco Culture National Historical Park. Although our primary focus at this time is to stop the paving of the road into Chaco, we are interested in all threats posed to the canyon, including those posed by energy exploration in the area." More about the efforts to pave the road in future posts. See the photo to get an idea of what both roads look like. In short, the wonderful character and accessibility of Chaco sites would change drastically if the 20-mile dirt road coming in from the north is paved. And that would make many of us very sad. 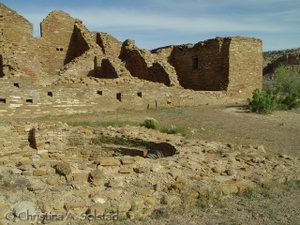 So I encourage you to get involved in preserving Chaco, if you feel moved to do so.